If you're stuck in a rut with your results and you want to take things up a notch try this handy guide to plateau busting. Get ready to boost your results! But first, you are probably wondering just who the heck I am right? I thought so. I am from a small town and a fairly small family of French and English descent. I was raised with core values, being honest, working hard and always following my dreams. All of those things led me to where I am today, but it was not without first paying my dues and learning from my mistakes. Notice I didn't say failures as I really don't believe there is such a thing as failure unless you accept that you have failed. The term "failure" should be looked at as just a deviation in your ultimate path to where you want to go. It's not a dead end. Of course, since you're reading this report on plateau busters, I think its safe to say that you also don't believe in failing otherwise you would not be looking for the answer to reaching a new level in your physique right? Good. Now, I used to be a very skinny kid with many self doubts about my physical appearance and was in desperate need to gain muscle and transform my body to overcome these sabotaging thoughts and self image issues. I discovered the power of an online fitness program while in college, had success with it and decided I wanted to know more! I then took my knowledge to new heights and learned more and became a certified NSCA personal trainer and FAME Champion Fitness model. I am not kidding, I actually won the overall championship in the Male Fitness Model Division and it was my very first competition! It was only after achieving success in my own muscle building goals that then led me to want to help others do the same just like today I want to help you overcome a plateau and to do that, I am going to give away some of my best advice possible. I have put a lot of thought and research into this report so please be sure to read it from top to bottom and review it again and again if necessary. Just recently, I hit a plateau myself, and I started to incorporate some of the tips I share in this report And I saw a noticeable difference in only two weeks. Below are the pictures I shot and they were only 2 weeks apart. As you can probably see, I busted through my plateau to put on even more muscle and shed some fat in the process! Get ready to start seeing a big change in your physique and start to see improved muscular strength, size and more gains than before. It's time to bust that plateau! If you have never hit a training plateau, consider yourself lucky! Eventually everyone will run into a point in their training when they have a stop in their progress whether it is muscle gain, strength increases or just overall performance. A training plateau is a time when you are no longer progressing in your workouts. You may have simply stopped being able to add more weight to your sets, or perhaps you haven't gained any additional muscle in quite some time. The worse part about hitting a plateau is that it could be due to a number of reasons which only leaves you feeling more confused than ever! Could it be you're training too much, not training enough, eating too much, not eating enough, changing your workouts too often or not often enough. Also, how do you truly know when you have hit a plateau or are on the verge of overtraining? Are there tell tale signs to look for? The answer is yes! I will be covering every one of these concerns throughout this report to narrow down the possibilities and give you a plan to put into action right away. Why Have I Hit A Plateau? Without going in too deep right now, because we will be diving deep later, hitting a plateau is quite common and you shouldn't freak out when it happens (especially now that you hold the answers to busting through it). But in a nutshell, a plateau is when our bodies become accustomed to the stresses we place upon it throughout weight training. It can also become accustomed to a certain caloric intake. The reason behind most plateaus is lack of strategic modifications in training programs, nutrition plans and listening to your biofeedback. Those are all high level views of why you have hit a plateau. When you don't give your body a reason to grow anymore, it won't! When you don't adjust your caloric intake after your metabolism requires more calories to fuel your body for more muscle growth, you will plateau! When you train too often, or too long you begin to enter overtraining syndrome (OTS) which always leads to a plateau and frustrations. What Can I Do To Bust Through A Plateau? When you hit a plateau you can choose to do three things; quit, keep training regularly and be satisfied with not gaining anymore or BUST through this plateau as if it were nothing at all. Hopefully you choose the last option and if you have the will, I will provide you with the way. You have to make changes to your program design. Now before you switch everything upside down and start doing the opposite of everything you have been doing, I want to first let you know, you should always start by changing 1 or 2 little things to begin with. Never make so many changes that you cannot accurately trace back to what caused the plateau in the first place. Start by making small changes and assess if they made a difference or not within a week. Then, if you need to, make additional changes. But always start off with small changes as our bodies respond much better to smaller changes and it's much easier to do than change everything all at once. Now it's time to identify some things to watch out for if you suspect you might be hitting a plateau or have entered into the dreaded overtraining phase. A common sign of hitting a plateau or even beginning to enter the overtraining stage is when you suddenly experience a loss in overall strength. Now I am not simply referring to when you don't progress in a workout or exercise. No. What I am talking about is when you notice a significant decrease in your performance and you can no longer match the lifts you once did. This is a sign that your body has not been able to properly recover and grow more muscle tissue. Worst part is, sometimes, when you damage your muscles to this point, you become weaker. Hence this is why a loss in strength will occur. Although I do not believe achieving a pump when you are working out directly translates to muscle growth, I do believe that if you can no longer feel a pump in your muscles when you are working out that this is a sign that your body is not fully recovered. Ever notice when you take a break from training, or when you first began working out, your muscles would fill up and you would get that famous 'pump' feeling? Did you also notice you don't get that nearly as much the longer you have been training without a break? This is yet another sign that you're on the road to overtraining which will inevitably lead to a plateau. When you lose motivation, it could be caused by a number of reasons such as personal matters, pursuit of different interests but if those are not your reasons then it is more than likely caused by hitting a plateau otherwise known as overtraining. At this point, your body is tired, fatigued and does not feel like going to train with heavy weights. This is pure instinct and your body will tell your brain 'We need to recover...STOP training'. You see, your body knows better than you might think. As a motivated trainer, you would more than likely just want to push through and try to blast through the plateau. Of course, in this case, you need to do the opposite. Hard to do I know, but you have to do this in order to let your body recover properly. A good rule of thumb when trying to build muscle is to constantly progress in your workouts and exercises every week. The progression doesn't have to be much, but it does have to be enough to trigger new growth. This could be an extra couple of reps on your bench press or even adding 5% extra weight to your bench press and completing the same reps as you did previously with a lighter weight. All these little progressions lead to new muscle formation through the 'adapt and grow' principle. When you are training hard, eating ample amounts of calories to build muscle and paying attention to recovery, you should have no problem progressing in your workouts. However, if there comes a time when you have not progressed in any exercises of 2 consecutive identical workouts, then this should be a big sign that your body has reached a plateau and it's time for a change. This rule only applies when you haven't progressed in ANY form. If you are having a hard time on just one exercise, but progressing in the other exercises of your workout, you are still progressing. You may just need to change the exercise you're having a hard time with. This happens quite a bit amongst aggressive trainers. Feeling flush in the face is an indication of overworking your body past the point of comfort. It can be brought on by many different factors, but generally speaking, when you feel red in the face or your ears feel like they are burning, this could be a sign of overtraining or being over-stressed from numerous causes (work, training, emotionally). It doesn't matter which is the primary cause, there is only one solution; rest and relaxation. Even if you know the cause is something going on in your personal life that's not related to training, it will still have an effect on your training. Stress causes an increase in blood pressure which will in turn cause your face to become pink/red and flushed. Your body is smart, and it will give you the signs when it feels like you're not listening to it, and this is just another one. For those of you, who have never experienced this, don't think that you are never overworked or stressed because that's not the case. You may just be the exception to the rule or your body might have a different way of signalling overtraining and stress. Typically when you start to feel grouchy, down, slightly depressed or just don't have that same edge you first had when you started training, it may be a sign that you need to rest up and take a break from the gym. Our bodies release large amounts of cortisol when we are stressed out and we can become stressed when we overwork our bodies. Cortisol works directly against any muscle building you might be trying to accomplish. Generally when I don't have that same aggression factor when I am lifting in the gym, I know I am either on the verge or have already entered into a plateau. What's the point of continuing to try and training at 50% of your regular intensity? You won't be setting any new personal bests when you are in this state, so the best thing to do is to take some time off and let yourself recover. If you're just having a bad day and that's the reason behind your bad attitude, then don't worry, it happens. But, if this is consistent over several workouts, it may be a sign to cool it for a while. If you are on a path to gain muscle mass, you should be aiming to gain about 1-2lbs per week. This is a good progression for lean muscle gain, and of course you can gain at a more accelerated rate if you're ok with a bit more fat gain. Now if after one week, you don't gain anything on the scale, don't freak out just yet. After all, it happens and the best thing to do is simply look back on your past week or so of training, nutrition and rest. There are many things you can try, which I will cover later on, that will automatically get you back on track to gaining more muscle. But if after two consecutive weeks, you don't see any increase in muscle mass or even weight, then chances are you have hit a plateau and will need to make some changes. Although this might be a more advanced overtraining syndrome for some, it is still worth noting. Basically, there are two different types of overtraining syndromes that can affect your resting heart rate. The Sympathetic Form: Common in physical activities such as sprinting or fast explosive heavy lifting. The Parasympathetic Form: This form is more common in endurance type of activities such as higher rep training or long cardio sessions. Both forms will have different effects on the resting heart rate and it's fluctuations, but one thing is certain and that is overall performance suffers and fatigue sets in faster during exercise once you enter either of these two overtraining syndromes. Sympathetic Form effects on resting heart rate: When one enters into the sympathetic form of overtraining, the resting heart rate can be excessively high when compared to your previous normal heart rate for a given activity. Basically, your heart rate will rise much higher than normal when in this state. Parasympathetic Form effects on resting heart rate: When one enters into the parasympathetic form of overtraining, you might find it hard to sustain the same workout at the usual set point that you normally would. Your heart rate will be significantly decreased and you will more than likely fatigue prematurely without ever reaching the desired intensity or physical exertion you were aiming for. In basic sense, you won't be able to match your normal heart rate even if exercising at the same intensity as before. When things are going well in your training and you are eating clean and seeing good gains, you are typically hungry and can keep that appetite all day long. But, when you begin to fatigue and you no longer have that aggressive edge when lifting, you might also notice a decrease in appetite. This is due to the fact that when our bodies become overworked and stressed, our muscle receptor sites can become 'tired' and are not longer as responsive to accepting those calories and shuttling into the muscles as stored glycogen. At this point, your metabolism might feel sluggish and this is simply because a tired body is less efficient at everything it does which also includes nutrient assimilation, digestion and proper partitioning. All point to a sign of a potential plateau. Now its time for the good stuff. So far we have identified what causes plateaus, covered common questions about overtraining and we also identified The 9 Major Signs that might indicate a plateau or overtraining. So how do we get around a plateau or beat overtraining? Well there are countless methods that we can use, but I discovered 7 fast ways in particular to bust through any plateau and have you progressing again and beating overtraining. Some apply more to overtraining syndrome (OTS) while other some of the other tips below apply to overcoming a plateau. Although they are closely related, I will identify which technique should be used in which instance. What Causes Muscles To Grow? The trick is to give it a reason to build new muscle tissue instead of just repairing the muscle tissue that was previously there. The way to do this is to apply progressive overload to your muscles through several methods which we will discuss throughout these 7 tips. You see, over year's of evolution and development, our body's genetic profile have been developed to do one thing; SURVIVE! Now comparing this principle to gaining muscle, if we stress our muscles one week with a certain amount of stress (stress created in a workout), then we return to the gym the week after and apply a greater stress within the same workout, our bodies will respond by adaptation and it will grow new, bigger muscle tissue. The reason for doing this is because, it does not want to experience that stress again. And since you exposed your muscles to the greater stress stimulus, it signalled a response to grow bigger to avoid that happening again. Understand? Your body will adapt under the survival principle. But the trick is to not apply too great of a stress to your muscles to the point that you cannot efficiently repair and recover. That is why it is very important to apply 'progressive overload' in your workouts. Do not fall into the illogical thinking that if an hour workout is good, then a two or four hour workout is even better. It doesn't work that way! The best way to progress in your workouts is to apply progressive overload using absolute overload and relative overload. Absolute Overload: Absolute overload is achieved when you overload the muscles with a heavier weight but using the same workout variables as before (rest time, tempo etc). This technique has the greatest chance of triggering new muscle as it taps into the type 2b muscle fibers which have the greatest growth potential. Relative Overload: Relative overload on the other hand is based around applying more sets, more reps and this principle does not necessarily take the muscle to muscular failure. Both techniques should be used at different times. Some argue that you should not use relative overload, but I disagree. I do agree that constantly adding in more sets and making a workout longer and longer will inevitably lead to overtraining and lack of progression. But, when used properly, we can easily use this method to force our bodies to adapt which will then lead to stressing the muscles with heavier weights (absolute overload). Still with me...? Good. Let's get into the nitty gritty of overcoming overtraining syndrome and busting through that plateau, ok? Most people often don't associate resting with muscle growth. After all, you only grow muscle when you are working out right? Wrong! The truth is, your body doesn't assimilate new muscle while you are working out. It's actually the exact opposite. It catabolises muscle tissue (breaks down muscle), then when you rest and re-fuel properly, your body will build new tissue in its place. Remember the progressive overload principle? Well you need to give your body sufficient rest time between workouts so that your muscles have a fighting chance at fully repairing. Now, given a perfect world, you would never miss out on 8 hours of sleep a night, you would never get stressed out, you would never do more activity in one day then you did in another and everything would be sunshine and rainbows! But, since this is not the case, and life happens to everyone, you need to take precautionary measures. One to consider is a planned recovery week. Every 6-8 weeks, I plan a recovery week where I don't workout at all! Not even cardio. I plan that week as a complete rest and recovery week to give my body sufficient time to repair itself and ensure I return to the gym stronger and refreshed. Gives you a marker to aim for when training. Knowing you have a break coming up will help you stay focused and train harder. Besides the physical benefits to taking a week off training, there are also some very psychological benefits that come into play as well. You always want to make sure you create a healthy balanced lifestyle. Also, by specifically planning that week off, you make sure that you actually take the week off. If you didn't plan it, you might let it slip and end up training for a much longer time frame. Something I found to work great is to plan my recovery weeks around vacations or time's when I know a gym won't be as accessible. Bottom line take at least 4-7 days off every 6-8 weeks after subjecting yourself to an intense progressive overload training program and you will benefit big time from it. The Post-Failure Heavy Overloading Method is a technique that I like to include in my strength training workouts where I am lifting heavier weights for fewer reps and using longer rest periods. Recall: The general rep range for muscle gain is anywhere from 6-12 reps.
Now, lets use a bench press as an example in this scenario. 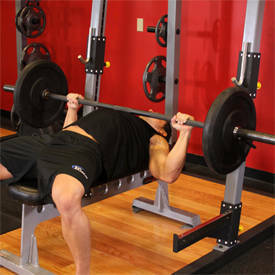 Let's say that your max bench press is 200lbs for 6 reps on your final set. Perhaps, you haven't been able to beat that personal best in over 2 weeks by adding more weight to the bar or even adding an extra rep.
On your final set, the one that you cannot progress in, you will do the exercise just as before. Then, if you haven't beaten your personal best of 200lbs for 6 reps, you will rack the weight, rest for no longer than 20-25 seconds then pick it back up and pump out as many more as you can. You may only achieve a few extra reps and that's ok. The key here is to just coax the body into doing a bit more work. Of course, after applying this technique for a few weeks into a few exercises, you should return to regular training and this time around add weight to the bar and try and beat your old personal best using your old workout parameters. Be sure to have a spotter for safety reasons especially if the exercise is one that puts you in a situation of vulnerability such as the squat, bench press and even barbell military presses. Dropsets are a technique in which you add additional volume after reaching failure within a workset. Let's pick dumbbell shoulder presses. If you have reached failure on a set of 8 reps and want to further fatigue the muscle group to try stimulate new growth, simply have another set of weights ready to go and jump right into another set. The above is a 3 sequence dropset using a subsequent weight that is about 1/3 lighter than the previous weight. That is the rule of thumb to use when dropping the weight. Those numbers are not etched in stone, so if you find you are failing before hitting that rep range, or even if you perform more reps than listed, that's ok. So long as you are not surpassing 12 reps on each set or dropset, you will be good. I would only incorporate this technique on your last set of an exercise as to not hinder your lifts later in the workout. This technique also works great for more isolation exercises such as side shoulder raises or even on a peck deck machine since sometimes the weaker smaller heads of a muscle group are not as efficient at making dramatic strength increases. Because of this reason, using more volume based approaches work best. For anyone who is familiar with exercise protocols, you should know by now what a superset is. For those of you who don't know, a superset is when you combine two exercises either for the same muscle group or opposing muscle groups and you perform two exercises one right after another with no rest in between. Basically, you perform two sets of two different exercises which form a superset. Now, a regular style superset will have the trainee performing above 15-20 total repetitions by the time they have finished the superset because both exercises will usually call for 8 to 12 reps. This is great for conditioning at times, but there is a much better potential for growth when we keep the rep range in that 6 to 12 range. Introducing the modified "new school" superset protocol. Instead of aiming to perform 12 reps on each exercise, I want you to focus on only hitting about 6 to 8 reps on the first exercise as well as on the second which will bring your total to hopefully no more than 12 reps. If you achieve more reps than that range, add more weight the next time around and try to stay within that sweet spot rep range. This focuses more on triggering those type 2b fibres again, which, as you should now know, have the greatest growth potential. The possibilities are endless and this is a great technique to increase the intensity to a workout without adding much more time to the total time inthe gym. Ok, I'll admit, this one sounds a little technical am I right? Don't worry though; it's actually simple but extremely effective. This is a technique I see being performed the wrong way unintentionally every time I hit the gym. Generally, there are guys who get spotted for every set, and the spotter never lets go of the bar. That is what you call 'training your ego'. The only problem is that it doesn't do much for muscle growth. But there is a way to use a spotter correctly to trigger new growth. On one of you final sets of an exercise, let's pick bench press, ask someone to spot you on your next set. Now, you will need to explain to the person how the set will be performed to ensure you can trust this person to help you. Better yet, I wouldn't even try this technique without a spotter that you trust. You cannot perform this technique without a spotter, so be aware and don't put yourself in any danger. There are lots of other techniques that don't require a spotter and are much safer. This is definitely more advanced. So on your final set, pick a weight that will have you failing near 6 reps only this time, you are going to have the spotter follow you once you fail on the 6th rep. So when you can't perform any more concentric movements (pushing the barbell back up) around that 6th rep, you are going to focus on lowering the bar (eccentric action) by yourself, with the spotter following you, and at the bottom of the movement, the spotter will help you get it back up then you will repeat for about 2-4 reps. So this technique stresses the stabilizer muscles after pre-fatiguing the type 2b muscle fibres. You can stimulate growth using both eccentric and concentric movements. In this particular case, we are stressing the muscles by going past failure by having a spotter help us out. You don't want the spotter to always be helping you, but having one around and helping out for this set and post fatigue, then you can stress the muscles further than you would have had you not had a spotter. In every workout program there is usually a set protocol to follow for rep ranges. Now, if it is a good program design, it should have variations in rep ranges very 4-8 weeks. The reason I cannot be more specific is because everyone is different. For example, beginners could potentially follow the same workout for nearly 3 months and continue to see progress simply because they are new to training and their muscles still have a lot of catching up to do so to speak. But, an advanced trainer may need to switch rep ranges every 3-4 weeks to keep things from getting stale. The key is to do this in a planned manner. Map it out. Make a complete periodization schedule where you already have your training and workouts laid out before hand. This will give you something to stick to and commit to the end. I might be getting a bit ahead of myself, so let's just focus on the plateau buster application, ok? So, this is a very simple tip and will not require much effort on your part. Remember how the body responds to change? Remember how we want to coax the body and not shock it too extremely? Well by changing rep ranges this can be accomplished. In basic terms, if you have hit a plateau and you have been doing straight sets of 4x10, switch it up! Do 4x12, or 3x8. If you have been pyramiding your sets such as 1x10, 1x8 and 1x6, switch that up as well to 1x8, 1x6 and 1x4. This particular modification will allow you to use a heavier weight. You can also take the route of adding less weight and pyramiding your sets with an increase in reps instead. Both versions will do what we want; provide a new stimulus of change so that the muscles have to adapt and grow bigger. Simply change your rep scheme, establish the baseline of what weight you can lift within that range, then progress on it until you cannot progress any longer. Word of caution: Just to let you know, if you're doing 4 sets of 10 and think that making a jump to 10 sets of 10 will shock you body, let me tell you that it most certainly will! But it will be too much of a shock to the body, and can quickly lead to overtraining syndrome (OTS). Small changes will be the sum of big results over time. Changing exercise variables is a simple and valuable technique to forcing the body and muscle's to adapt because of a new stress stimulus. However, this technique should not be considered before attempting all of the techniques described above. The reason being, there are still lots of growth potential when you reach a plateau and the most 'bang for your buck' plateau busters are the ones that stimulate those type 2b muscle fibres. This technique is still useful and should be experimented with after trying all the other plateau buster techniques. It will keep things fresh and allow you to begin building different areas of the muscle. Grip position on a barbell when performing a bench press. You can move in by a few inches or out. Foot spacing when performing the squat exercise. Move your feet a little closer together or further apart. If you have been performing incline barbell presses, make a switch to using dumbbells instead and the same if you are always using dumbbells for shoulder presses, you can switch to barbell presses instead. If you have been using one particular machine to work a specific muscle group, try changing machines all together. The point is you should modify some exercise variables to work weak points and to create a state of imbalance again. After so many workouts, your body simply gets used to the same movement and it is not longer a shock. You have to continually challenge yourself and make your workouts hard again. If they are not difficult, there is very little possibility or chances of encouraging new muscle formation. Do not change everything all at once. Simply make small changes in your workouts and that should be sufficient. Make sure to give yourself sufficient time to apply progressive overload in your new workouts. Do not change variables on a weekly basis. Remember, it is important to change things and then allow you ample time to progress in the new exercise modification strategies. If you change things every week, how will you know if you are progressing? You need to create a reference point and then use progression techniques again on your new exercise variables. Don't panic if you have to use a slightly lighter weight. For example, when squatting, generally, the closer your stance, the less total weight you can squat. But it is not always about the total weight. Just remember, you are changing a variable in your workout which might have an effect on the weight you use for that exercise. But just consider that the weight is now only relative to the new exercise variable. Do not compare the differences in exercise poundage. At this point we have covered quite a bit on what a training plateau is, how it's caused and some advanced techniques to use to overcome your plateau. But you might be wondering how you can incorporate these into your training plan you have right now. If you don't have a training program at the moment, then that right there is your biggest mistake and you need to get one immediately. The plateau busting techniques shared with you within this manual are meant to be used as tools in a toolbox. They are great to use when you need them but you should not necessarily use every one of them at once. Simply pick the ones that apply to your training program at the moment. When you notice you are reaching a plateau on your bench press for more than 2 workouts in a row, you might want to incorporate a technique at this point. Which one will also depends on your training plan. If you are serious about gaining strength, then you could use the rest-pause method or even the forced assisted rep method. If you're stuck on a side shoulder raise, try using the dropset method or even a superset method. Of course, I hope you realize that the entire point of including plateau busters is not to continually add more and more sets of exercises and make each workout more complicated than the previous one. No, the point of including plateau busters and overcoming a plateau is so that you can use creative methods to trigger new muscle gains, performance enhancements and strength increases so that eventually you can return to your original plan and progress again without the plateau buster techniques. Make sense? Good. So essentially, what you want to do is to include a plateau buster technique for about 2-3 workouts or 2-3 weeks. Then, after performing the methods in your workouts, you will resume your previous workouts without the plateau busters and under the same parameters you were using prior to including the plateau buster techniques. When you go back to your regular training, you will then be able to progress naturally again within the exercises and you will have overcome your plateau. But before you go and add in these techniques, always remember that overtraining and lack of rest is normally the #1 cause of a plateau. So before you hammer away and include every plateau buster from this report, be sure to try resting for anywhere from 4-7 days to ensure you are properly recovered. Well, that wraps up The 7 Fast Ways To Bust Any Plateau report and everything you need to do to beat overtraining and overcome obstacles. I also want to leave you with some summary notes you can print out and keep with you at all times in case you need a quick reference.